Are you someone who loves essential oils? For years, I loved making my own soaps and products, but I had to give up that hobby as I got busier with the blog, and traveling with my husband’s career. With us being more stable though, I have considered getting back into one of my favorite hobbies. One of the things that have changed since back then though was essential oils becoming much more popular. Since they were simply scents to me before, I have tried learning a bit more about the various benefits of essential oils, especially when it comes to aromatherapy. Luckily, as I started my research, I received a complimentary copy of The Aromatherapy Beauty Guide: Using the Science of Carrier and Essential Oils to Create Natural Personal Care Products for review. To say the least, I couldn’t wait to start reading when it arrived. The Aromatherapy Beauty Guide: What is It? This comprehensive book provides a wealth of evidence-based information that provides a sensible and sound approach when it comes to creating your own natural product formulas. With clear and easy-to-follow directions, you’ll be able to create your own signature products that will complement a natural lifestyle as well as meeting your individual skincare needs. Includes information on everything from anatomy of the skin, the all important mind-body connection, the nature of skin types from dry and sensitive skin to combination and aging skin as well the art of skin care and creating your personal skin care apothecary — all without chemicals and preservatives — just the tried and true chemistry of essential oils. Information on all the raw ingredients you’ll need to get started (clays, flours and grains) as well as comprehensive information on the important role of carrier oils. Danielle discusses the essential properties of 16 carrier oils like Coconut Oil, Jojoba, and Marula Oil. Plant butters such as Shea butter as well as herbal infusions are also featured for their healing and therapeutic properties. 35 essential oils are featured from Bergamot and Carrot Seed to Roman Chamomile. Discover all you need to know about essential oils including the biosynthesis of essential oils, the genus and varieties as well as a directory of the oils best suited to your personal care and needs. Over one hundred (100) formulations with easy-to-follow instructions on creating products for the face, body, bath, pregnancy and breastfeeding and personal care products for men. Danielle Sade, BSc, CAHP has over thirty years of experience teaching and practicing complementary health practices where she creates educational certification programs in aromatherapy and also leads workshops in making natural product formulations for personal and professional use. She’s passionate about sharing the sound scientific basis upon which aromatherapy is built and making this invaluable information available to everyone. The aromatic molecules of a plant not only have the power to shift the way you feel but the essential oils from plants also have powerful therapeutic properties. It’s the dynamics of these therapeutic actions that form the foundation in Danielle’s successful approach to skin care. Danielle was also inspired to write this book because she herself has experienced skin sensitivities that didn’t improve even after visits to skin specialists and conventional therapies. When the symptoms didn’t subside, she took matters into her own hands and sought out a natural-medicine healing approach through essential oils. Making your own natural botanical creams and lotions is surprisingly simple and very satisfying — you’ll soon be on the road to recovery and living a more natural lifestyle. Honestly, I have to say that I am very impressed with this book. It includes a variety of awesome, easy to make recipes that are perfect for anyone who is a beginner at essential oils. With how it is designed though, it is also great for those who are more experienced, going into a detailed analysis of the benefits of the oils and the science behind why everything works. 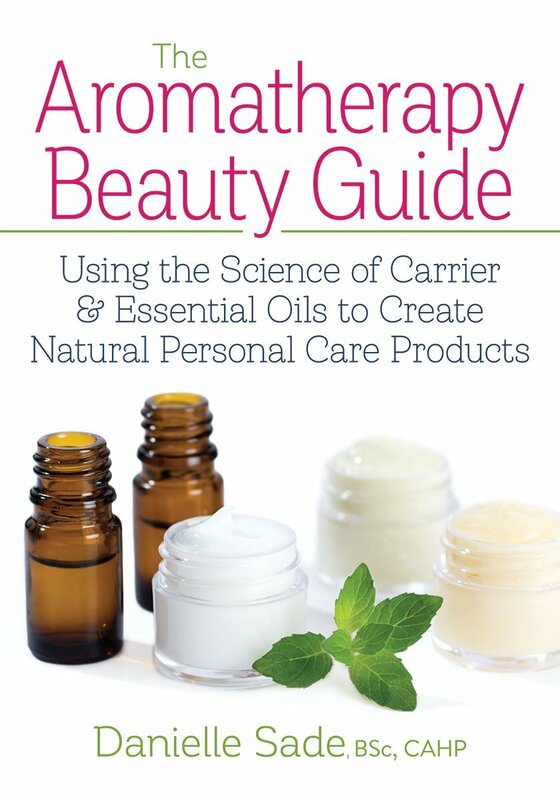 If you are looking for a go to book for making your own beauty products, I consider The Aromatherapy Beauty Guide: Using the Science of Carrier and Essential Oils to Create Natural Personal Care Products an absolute must to add to your collection. The Aromatherapy Beauty Guide: Where to Purchase? Want to purchase this book for yourself? You can buy The Aromatherapy Beauty Guide: Using the Science of Carrier and Essential Oils to Create Natural Personal Care Products on Amazon.com for only $19.95. Love the ideas on here. Thank you! I would love to flip through this book. I’ve been experimenting with making my own facial serums. I really must get this book. I am so interested in essential oils and aromatherapy, but there are a lot of unanswered questions I have. I try to research, but it’s better to have it all in one place, as a reference! Our daughter swears by her essential oils. Thank you for sharing. It would make a nice gift to give this book and some essential oils and carrier oils to someone who is into it! There are so many essential oils out there. This book sounds like a great way to know what ones might be of interest. I’ve been wanting to know and understand more about essential oils and this my be just the book to teach me. I like using essential oils but don’t know much about how to really get use out of the ones I have. This would really help.